This aircraft is another success story for Bombardier. It is well liked by airlines and passengers. On short haul routes the Q400 combines the gate to gate journey times of a jet with the lower operating costs of a turboprop. 75 seat advanced twin turbo-prop regional airliner. All new model with full moving parts, doors with air stair and animated pilots. Accurate and pleasant flight dynamics. Fully modeled interior. Full documentation including manuals and check/ref lists. Custom panel and VC with digital (glass cockpit) gauges, custom sounds. Complete package for FSX/SP2 (DX9 graphics). Three liveries included, Flybe (UK), Horizon and Qantas Airlink. By Jean-Pierre Brisard and Bob May - Premier Aircraft Design. 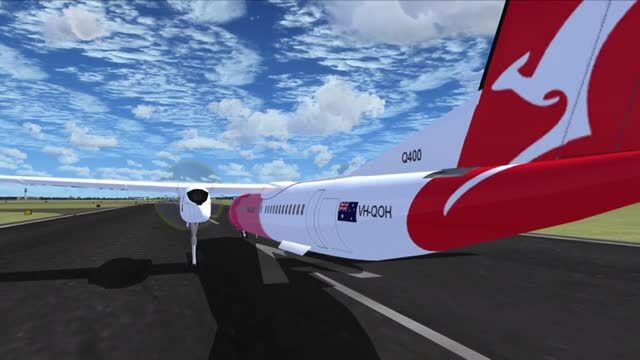 Screenshot of Bombardier Dash 8-Q400 in flight. Extract ALL (Repeat ...*ALL*) the files into the *FSX MAIN* Folder using WINZIP* in Classic Mode...Do not use the Wizard...Make sure the "Use Folder names" BOX is checked in WINZIP. DO NOT INSTALL TO SIMOBJECTS FOLDER, AIRPLANES FOLDER OR ANY OTHER FOLDER! New folders will be created and all files automatically installed. * Other unzip utilities may work as well, we have only tested WinZip. Vista/Win7 users may need to temporarily disable the UAC (User Account Control) to enable automatic creation of new folders. 4. Use keyboard shortcut 'CTRL-A' and this will select ALL the files. 6. Type in your path in the dialog box, the default location is C:\program files\microsoft games\microsoft flight simulator X.
or Browse to your FSX Location...Open the FSX main folder. For some unknown reason the VC gauges sometimes remain dark at night. On the Vc panel, located just left of the battery switch, we have installed a panel light switch. Click on this switch once or twice and the VC gauges lights will be restored. *Check list and reference list available from the cockpit kneeboard command. *Essential reading ... "Flying Tips" document in the manuals folder. 2. SHIFT-E opens/closes the passenger doors and airstair. The doors will not open in flight. 3. SHIFT-E-2 opens/closes the internal cockpit security door enabling views into the passenger cabin. 4. Wing fold command opens/closes the cargo door. The default wing fold command is Shift + C, yours may be different if you have re-assigned some keyboard commands. There is a cargo door open/close icon on both panels. 5. To raise your seat higher press SHIFT-ENTER (WORKS IN vC ONLY). 6. In the VC, Ctrl-W key toggles yoke on/off. There is also a yoke icon on the VC panel. 7. The PFD, MFD, EICAS & radio panel displays have magnified pop-ups, use mouse click. LAST, AND MOST IMPORTANT ... TO GET THE BEST FROM THE AVIONICS AND THE PANEL READ THE DOCS IN THE MANUALS FOLDER. Screenshot of Bombardier Dash 8-Q400 cockpit. The archive dhc8-q400_x.zip has 219 files and directories contained within it. This awesome remake of the Bombardier Dash 8-Q400 is one of the most impressive out there in that it manages to follow the same upward curve of the real thing. As a hugely popular part of the Bombardier list of aircraft, this aircraft is well-loved by pilots and passengers alike. By managing to find a way of making the flight comfortable and fast yet equally economic, this manages to be the best of both worlds in many ways. Now, with this package, you can easily take things to the next level and give yourself something a bit easier to use than ever before. With 75 seats, you’ll be flying with a significant amount of depth and detail in there as well as a lot of responsivity for getting those passengers from A to B! The aircraft, though, has been created to capture the mood and style of the real thing almost perfectly. The detail in capturing the flight style and the dynamics has been widely praised across the board, making it an easy and effective solution for those who are desperate for a spot of realism to be included in there. However, this also comes with a range of documentation that you can use to your benefit to help you understand the aircraft and its processes much more clearly than before. The interior itself has been deeply remodeled and changed to ensure that it manages to capture the feeling and the style of the real thing just right. It also comes with animated pilots and air stairs, to make sure the whole thing can really take inspiration from its real-life counterpart and look outstanding. Raise your seat and have a more comfortable position in the cockpit! There is a known issue, though, with the way that virtual cockpit gauges work at night. Sometimes, the lighting will not turn on whatsoever and there seems to be no legitimate reason for this to occur. However, a simple workaround is to click the panel light switch to the left of the battery switch. Click on this a couple of times and panel switching should turn back on, giving you the light that you need! Might not seem like a flaw to everyone, but I get no overspeed warning on this, and can cruise along at 2500' at about 360kt. Doesn't quite seem realistic. Just tried with a default a/c and it's not my settings. Great plane! There is just one minor problem: I can't decrease the heading on the autopilot controls, and that made me crash into a mountain on the first flight. THANKS GUYS/A GREAT AIRCRAFT. I FLY FOR VA S 8 YEARS NOW/YOU NAME IT/CESSNA TO BOEING 777. A GREAT PLANE TO FLY./ IF YOU WANT A CALLSIGN/CAPTAIN2122/MY TWA CALLSIGN. Great plane I have so far not run into any issues. Then again I also haven't started the plane just free flight with the props going. Everything seems to work fine. Everything is really nice, but where is the autothrottle for this thing? Looks and works great, except the VC controls look a bit flat, but that's just cosmetic. The real concerns are the ILS landing doesn't work well and the fuel truck can't seem to find the plane. Also, should we be concerned about the security warnings when opening the plane in the simulator? Very simple install without using any WinZip or other program. Just move the dhc8-q400_x file from the Simobj/airplanes folder to the FSX/Simobj/Airplanes folder and the contents of the sound folder to the FSX/sound folder and voila. Flies like a dream and everything works. i Love it But i don't want WINZIP on my PC it's not that hard to make it user friendly. The cockpit controls need reworking..maybe layout needs some work too. ShftKey 2 for Radio, ShftKey 3 for GPS etc Pop-ups inoperable. Time for major update? Hey I have downloaded it and I LOVE IT! It's a very good freeware AC. I was wondering if I could make a repaint of this for FSXCC. You might have heard of it. It's a online landing competition hosted by KiloCharlie1. I will give all original credits to you. Where is located the speed marker (+ -) no panel? It's ok but for me, the gauges are almost unreadable, even in pop-up mode. I can read them on my 22" screen only in pop-up mode AND with a magnifying glass whilst leaning closer to the screen. Not the most comfy way to be sat whilst flying. I also have to press "W" to get the cockpit out of the way for landing. I am not overly impressed. Would like to try this appealing download, but WinZip on my PC will not process the files as it deems them 'corrupt'. Any suggestions how to overcome this problem please? Like for the Dornier, it's a wonderfull job. But like the Dornier, unable to start the engines. When I press the start button, the button and the light corresponding starts to flicker and engine does not start. Don't tell me, as someone did, to load another plane, start it and then load Dash8 from Premier Aircraft :-(. Looking forward for your answer . Is the cockpit model for sale?